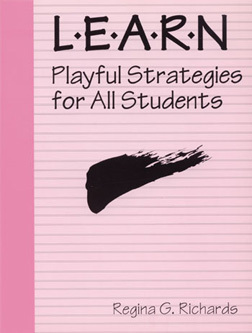 This book is designed to help parents and teachers * Focus on students� strengths * Use a positive approach to learning * Develop systems to use in teaching new concepts or reviewing learned facts * Encourage development of efficient study-skill strategies * Explore alternative teaching methods * Utilize a variety of ways to present information. All of the learning suggestions in LEARN have the potential to transform a student�s chances for successful academic performances into realized goals. There are chapters with strategies for a wide variety of situations, including * Daily living tasks * Reading comprehension * Written expression, and * General mnemonics. Mnemonics are a very useful learning tool and often a necessary component to help us remember information. There are many varied benefits of mnemonics. Mnemonics are a group of learning strategies that help capture information for storage and retrieval. Mnemonics stimulate spatial and simultaneous strategies and can integrate them with more sequential strategies. Mnemonics have a pattern, a critical component for successful recall. Furthermore, mnemonics take advantage of the strength that many children possess when they easily learn commercials and jingles.